Earthschooling is an award-winning (see award images & links on this page), secular Waldorf curriculum that is a complete but flexible educational curriculum based on learning from nature, real-life experience, natural rhythms, hands-on activities, storytelling, painting and handwork with natural fibers. Earthschooling uses the Waldorf curriculum as a framework and thus it includes lesson plans, instructional videos, and core curriculum created by certified Waldorf teachers and fulfills all the requirements of a Waldorf education. 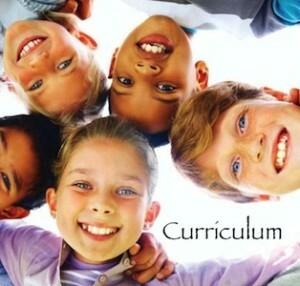 However, Earthschooling goes beyond what other Waldorf curriculum providers offer by including curriculum correspondence with core standards for your location as well as a full range of teacher support tutorials including Eurythmy lessons. In addition, a certified Waldorf teacher is available online weekly to reply to member questions in our live forum. Watch our short video below for a quick summary of what our basic philosophy is all about: 1. Flexibility in Style: We have made it easy for members to mix-and-match lessons, mix-and-match styles of education. We embrace all members from Waldorf parents/teachers to Montessori parents/teachers to unschoolers. Although this was designed as a Waldorf homeschooling curriculum it is being used by many public, Montessori and Waldorf school teachers world-wide. 2. A Real Connection with Nature: We go beyond the ‘nature walks’ and ‘natural materials’ and show you how to bring as much nature into your classroom as possible through weekly nature walk themes (for early childhood), herbal identification (for the middle grades), wildlife tracking and bald eagle monitoring for the older kids and so much more. Earthschooling truly guides you in making the earth your classroom. Our teachers and staff include herbalists, ecologists, and wildlife biologists. 3. Positive Community Support: No matter what style of education you use you will find a positive support network with other members and ideas about how to find your own unique educational style. Our discussions are always focused on sharing ideas and positive support. Our members and staff do not tell you what you “should be doing”. 4. Support for Diverse Locations: Earthschooling provides support for our Southern Hemisphere members and members in other areas of the world that do not experience the four seasons the way they are experienced in the “Western World”. 5. Support for Diverse Cultures: Earthschooling provides enrichment lessons for different languages, cultures and religions. We even provide alternate stories for members who want to replace lesson blocks in the curriculum. For example, in our “Second Grade Saints” lesson block we provide you with two sets of lessons – the traditional “Christian Saints” block and an alternate block that celebrates heroes from many different cultures and areas of the world. 6. Real Life Solutions: We realize that some children are transferring into our program from a public school or another system of education. We also realize that you may be teaching multiple children at the same time. We help you balance all your students’ unique requirements, create a schedule that fits those needs, and realize that not all students fit into a stereotypical pattern. 7. Administrative Support: We provide charts and information on how our curriculum matches up with the core curriculum requirements of your state or country. We can also provide your child with a transcript and graduation certificate for each grade. We have certified teachers on staff that you can consult with for support or to fulfill your state requirements (if your state/country has any – many do not). Where can I Purchase Earthschooling? You can browse individual curricula HERE or learn more about our Lifetime Family Curriculum Package HERE. 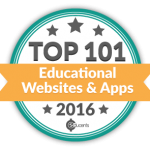 How does Earthschooling compare to other Waldorf-inspired curriculum providers? 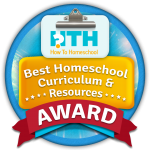 What Earthschooling program is right for your family, school or classroom? What are some of the specific subjects my child will be learning? 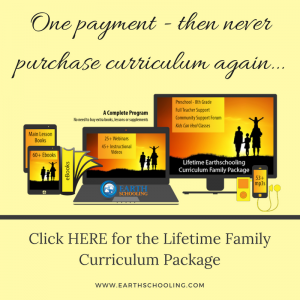 What is included in the Lifetime Family Curriculum Package?